Yes, click here to send e-mail to our tech support. Are there any file size and image size limits for the photo I upload? Yes, the photo must be 6MB or less in size. The minimum image size is 700 X 532. Please keep in mind, however, that lower image sizes will not look high quality when printed. For the best quality try to take the largest photo size that you can. For best results, take the largest, highest resolution photo that you can with your digital camera. Please feel free to use any lighting in your photo as our Santas can be adjusted for brightness. Distance is also up to you as our Santas can be enlarged or reduced in size with a simple click of our sizing tool. From the Preview Image stage you can go back and choose a new background. Please be aware however that should you do this you will lose any character edits that you may have made or borders that you may have selected. Once an image is "processed" the only way to make changes is to start over. No, once you begin you must complete the process or you will lose your work. So please don’t start until you are sure you have the time to finish! The process generally takes 10 -15 minutes or less to complete depending on your computer savvy. How do I share my new Santa photo? Once you have completed your photo we will show you how to email it to friends as well as how to easily post it to more than 30 social media sites, including Facebook, MySpace, Flickr and more. How much will my Santa photo cost? A single photo costs just $9.95. You may also upgrade to a package of 5 additonal photos (6 total) for just $10 more. We accept payment via all major credit cards and PayPal. Sorry, no cash or checks can be accepted. Each eGift Card or Redemption Codes can be used to redeem one personalized photo on our website. eGifts and Redemption Codes will not be replaced if lost or stolen. They also do not expire. 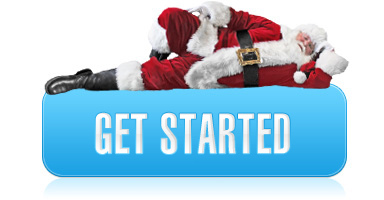 In addition, SantaOnCamera does not charge any fees for the use of our eGifts or Redemption Codes. Can I add to the balance of an eGift or Redemption Code? No, our eGifts and Redemption Codes have no balance or cash value. They simply deliver a coupon code that can be redeemed just like a store coupon in this case for a Santa photo on our website. How do you redeem a gift card, eGift Card, or Redemption Code? Visit our website at www.santaoncamera.com, create your photo and then proceed to the checkout page: Once on the checkout page enter your code in the box provided and click "Redeem", from there you will be sent your customized photo via email with a link to download it. Where should media inquiries be directed?